Where is the Chandni of this Chowk? Once known as the silver street and home of famous poet like Ghalib, Chandni Chowk is today a nightmare for motorists, residents, traders and tourists. You could imagine the beauteous vista of Chandni Chowk during the golden period of the Mughals in Shahjahanbad, present day Old Delhi or Dilli 6, when canals used to flow along the middle of the road reflecting the moonlight which is also why the road was named as Chandni Chowk (Moonlight Square). But as of now, there is no canal as British removed it in 1910 and the present situation is much different from what it used to be. For a brief historical background, Chandni Chowk was built in 1650 AD by Emperor Shah Jahan and was designed by his beloved daughter, Princess Jahan Ara. This seventeenth century road which is 1.3 km long, connects the Red Fort to the mosque built by his wife Fateh-un-nisa and was named after her, Fatehpuri Masjid. From the time of the Mughals till toady, it is one of the busiest and most famous markets in the country. The place holds a very prominent heritage and commercial value with it, mainly because of the centuries-old religious buildings that are situated along it like Gurdwara Sis Ganj, Sunehri Masjid, Digambar Jain temple, Gauri Shankar Mandir and Fatehpuri Masjid and markets like Nai Sadak and Dariba Kalan. But with time, Chandni Chowk has witnessed changes and the most evident change that came is the ailing condition of the traffic movement in the area. 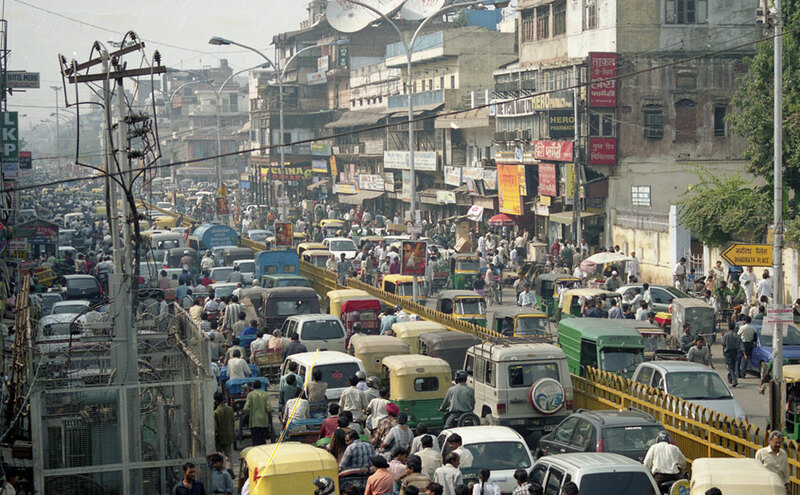 Once known as the silver street, Chandni Chowk today is a nightmare for motorists, pedestrians and tourists. Being a resident of the area, whenever I happen to cross Chandni Chowk, I always hear unbearable noise of honking cars and two wheelers. At times, I have also joined groups of people standing by the road watching quarrels and arguments and sometimes even one-on-one fights between a pedestrian and motorcyclist and autorickshaw and car drivers. I also recall a short chat that I had with an Italian tourist, Dino who came to Delhi for one day from Mumbai, especially to visit the area. I could see the expressions of irritation, shock and not to forget fear on his face while walking from Haldiram’s to Red fort. We literally had to fight to even walk on the so- called footpaths, half of whose widths were encroached by shops and vendors. That is the real memory that a majority of the tourists take with them after visiting Chandni Chowk. The present width of the main carriageway (effective road space for vehicular movement) is 22 metres and that of footpaths, which are present on both sides, is 3.5 metres which means the road is wide enough for the smooth flow of vehicular traffic and pedestrians. So what is it that makes Chandni Chowk a congested market? As a physical planner and a user of this road, I found three main issues. The first is the mixed flow of traffic, which means all modes from cars to two wheelers, from autos to cycle rickshaws, from a pedestrian and cyclist to a goods-carrying vehicle are all plying on the same road. The second is the “On Street” parking along the entire stretch which occupies half of the carriageway and the third is the encroachment of footpaths and walkways by shops, vendors and also by religious structures which force the pedestrians to walk on main road. To improve the condition of the area, the Shahjahanabad Redevelopment Plan was made. The plan prepared by architect Abhimanyu Dalal proposed a 8.5 metre carriageway with designated lanes for electric buses, non-motorized rickshaws and cycles with restriction of any other motorized vehicle. 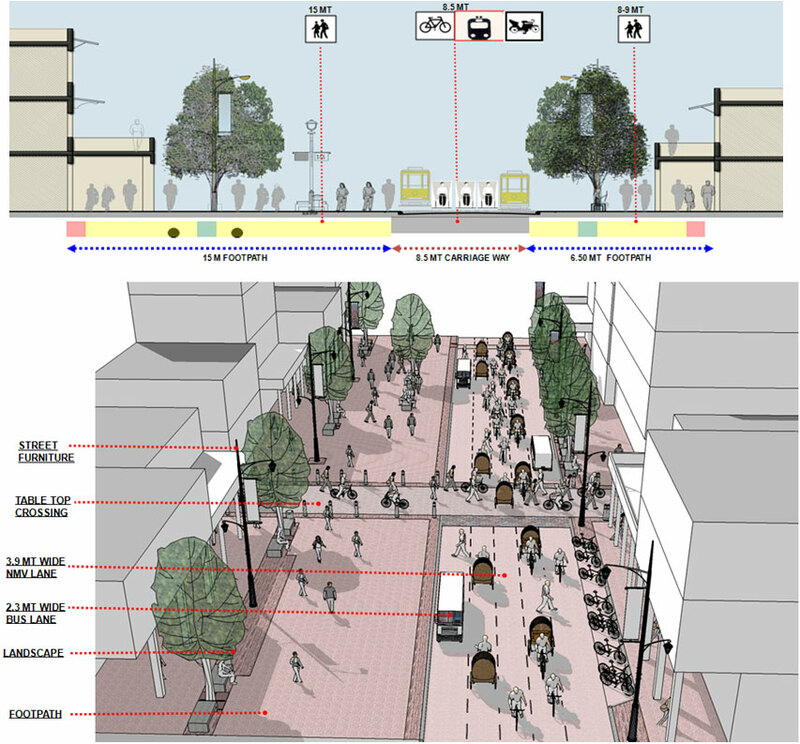 Walkways of 15 metres and 8 metres were also proposed for easy and safe movement of pedestrians. But this was all on paper. The ground reality is very different. The traders association is opposing the plan saying that it is not possible to restrict the entry of motorized vehicles in the area as it will have an impact on their sales and income. One of the reasons for the conflict, feel the traders, is that they have never been involved in the plan- making process. They argue that the plan has been made by other people sitting in their air-conditioned rooms. Recently, the Delhi government had decided to ply trams on the roads of the area. This provides the commuters with an efficient and quick alternate mode of transport within the walled city. The tram line will be constructed on left side of the Chandni Chowk road and covers a total stretch of 4.3 km connecting Red Fort, Jama Masjid, Digambar Jain Mandir, Gurdwara Sis Ganj and Old and New Delhi railway stations. This will be the second time when trams will run on the roads of walled city. They were first introduced in 1908, under British rule, but were scrapped due to congestion. Trams and the proposed plan cannot be of any worth until there is systematic implementation and enforcement.